WBR Corp, one of the reputed branding companies in Asia, recently organized a splendid mega event “Icon of the Year”. The main motive of organizing “Icon of the Year” is to recognize the topmost Iconic personalities from different industries on the same platform. The magnificent ceremony helps participants to improve their networking in different sectors of the Industry. The ceremony was conducted in association with Brands Academy, outdoor media partner Global Advertisers and media partners Self Made and Mediaz Group. The gala ceremony was graced by Mr. Kiran More (Former Cricketer and Selector), Mr. Arvind Sawant (MP) and Mr. Vishwanath Mahadeshwar (Mumbai’s Mayor).In addition to this, ‘Icon of the Year’ was a glorious event which was attended by celebrities and visionary leaders of the Asia who are well-known all across the world. This event will be telecasted on the prestigious National Business News Channels. 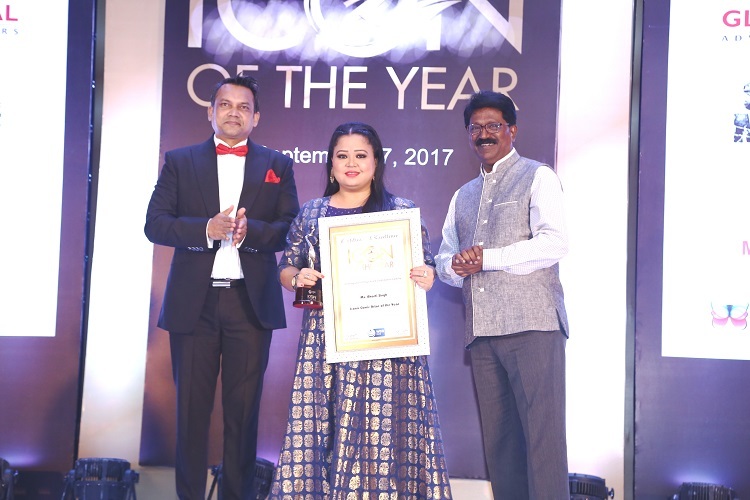 “Icon of the Year” was organized on September 17, 2017, at Novotel Hotel in Juhu, Mumbai. Along with the celebrities, the 20 best iconic leaders and brands were honored from the industry for their contribution in accelerating the growth of India in different sectors. Ms. Saroj Khan (Choreographer), Mr. Rana Kapoor (Yes Bank), Mr. Ritesh Agarwal (OYO Rooms), Meet Bros. (Singer & Composer), Mr. Amish Tripathi (Author), Ms. Bharti Singh (Comic Actor), Mr. Manoj Joshi (Actor), Ms. Faye D’Souza (TV Journalist), Ms. Tulsi Kumar (Singer), Mr. Raghunath Medge (President Dabbawala Association), Sanjay B Jumaani (Numerologist), Mr. Prem Nath (Leading Architect), Ms. Kavita Seth (Singer), Mr. Saurabh Shukla (Actor), Ms. Himani Shivpuri (Actor), Mr. Hiten Tejwani (TV Actor), Ms. Aishwarya Sakhuja (TV Actor), Mr. Gautam Mehrishi (Chef), RJ Malishka (RED FM), Mr. Ashish Bisht (Actor), Ms. Mithali Raj (Sports), Mr. Manoj Muntashir (Lyricist), Mr. Sudeep Nagarkar (Author), Dr. Sanjay B. Chordiya (Educationist), Ms. Rekha Chaudhri (Global Wellness Ambassador), Mr. Sahil Shroff (Model & Actor), Mr.Vijay Jadhav (Social Worker), Mr. Vilas Nayak (Painting Artist), Ms. Savi Sharma (Author), Ms. Sneha Kapoor(Choreographer), Mr. Sanam Johar (Choreographer), Ms. Payal Ghosh (Actor), Ms. Nitya Arora (Jewellry Designer), Mr. Ashwath Hegde(Entrepreneur & Social Worker), TTK Prestige Limited, Kwality Limited, Polycot Exim Pvt. Ltd., American Eye Care Centre, Mr. Sushil Kumar, Arihant Superstructures Limited, Toonz Retail, Dr. K. V. Satish, Grace International School, Sunrise Finserve Pvt. Ltd., Y-Star Cine & Television Pvt. Ltd., Paramount Coaching Centre Pvt. Ltd., A. K. Educational Consultants, Wintouch Ceramic, Dr. Surendra K Singh, Dr. Manish Khaitan, Mr. Abhishek Bansal, Dr. Ajay Shesh, Plexus Neuro & Stem Cell Research Centre, Mr. Piyush Dwivedi (Future Choice), Hanswahini Institute of Science & Technology etc. "The more you praise and celebrate your achievements, the more you will get motivated to perform better," said Mr. S K Sahu, Director of WBR Corp.
WBR Corp is brand consulting firm that offers the best solutions as per the need of our valued clients Innovation, Values and Ethics are some of the attributes of our company. Our intelligence and expertise in this field helps us to take your company to another level. We have rendered our services to a number of reputed companies across Asia.